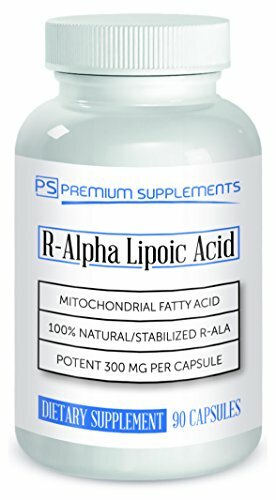 300mg Pure R-Alpha Lipoic Acid --Premium Quality! R-Lipoic acid plays an important role in glucose metabolism and energy production. The "S" form does not occur naturally in living systems and studies clearly indicate that the "R" form, RLA, is more biologically active than the "S" form. Premium-supplements R- Alpha lipoic is manufactured under the strict guidelines of a GMP and FDA registered facility. Our product is a stabilized form of R-ALA, essential for energy generation by mitochondria. USA made in a GMP facility. ZERO fillers, ZERO binders and ZERO artificial ingredients. Sourced in the USA and never from china. At Premium Supplements everything is Premium grade and comes with a 100% money back guarantee! Helps promote the body's antioxidant defenses. Helps protect against oxidative stress. Triple strength. Non-GMO, gluten-free, vegan. Sourced in the USA and never from china. If you have any questions about this product by Premium Supplements, contact us by completing and submitting the form below. If you are looking for a specif part number, please include it with your message.